While the two Detroit Cy Young winners – Justin Verlander and Max Scherzer – made headlines by getting lit up for 17 runs in the first two games of the Tigers’ series with Kansas City earlier this week, an unheralded pitcher in the same division has quietly put together a brilliant run without much fanfare . On June 18, Minnesota’s Kyle Gibson tossed seven shutout innings for the third consecutive start, blanking the Boston Red Sox on only one hit at Fenway Park. Unfortunately for the Twins right-hander, who is in his second season in the majors, got a no-decision as Minnesota couldn’t score against Red Sox starter John Lackey, who allowed only three hits over nine shutout innings. The Twins eventually lost 2-1 in 10 innings on back-to-back homers by David Ortiz and Mike Napoli. Gibson retired the first 14 Red Sox batters before Daniel Nava stroked a fifth-inning double for the only Boston hit off of him. Back on June 7, the sophomore righty pitched three-hit ball in his seven innings of work to beat Houston 8-0. Six nights later, he won 2-0 in Detroit with a seven-inning five-hitter. Then in the Red Sox game, one hit over seven innings with no walks and eight strikeouts. But that’s not all for the young right-hander, who now sports a 3.25 ERA. Back on May 28, he tossed six shutout innings of six-hit, no-walk ball against Texas but received a no-decision in the Twins’ 1-0 loss. In Minnesota’s 1-0 win at Cleveland on May 5, Gibson pitched seven innings of two-hit ball in another no-decision. He also blanked Toronto on a four-hitter over eight innings on April 17, winning 7-0. That’s six scoreless starts through his first 14 outings. In three other starts, he gave up exactly one run. So, a fantastic season so far for Kyle Gibson, and three straight scoreless starts and counting. 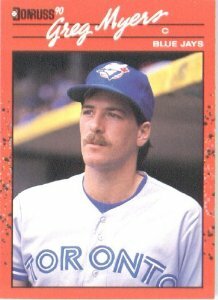 Though Greg Myers had never caught a knuckleballer prior to Candiotti’s arrival in Toronto in 1991, he still handled the new Blue Jays knuckleball pitcher very well. In the eight games that the pair worked together, Candiotti notched a 0.91 ERA. I do want to bring up Tom Candiotti’s 1991 season, where the knuckleball specialist had six scoreless starts and also seven outings where he allowed only one run. That’s 13 of his 34 starts where he gave up one run or none, not bad for a knuckleball pitcher. Candiotti nearly had the same streak as Kyle Gibson, but it ended in the ninth inning on July 16, 1991 in Kansas City. Candiotti had been traded from Cleveland to Toronto on June 27, and in his second start with the Blue Jays threw seven shutout innings against Minnesota on July 3 for a 4-0 win. On July 11, it was eight shutout innings in a 2-0 victory over Texas. Then came July 16, where Candiotti took a 1-0 shutout in the bottom of the ninth inning against the Royals. So, if he came out of the game then, he would have had three straight scoreless starts. However, he was left in the game to try and complete the one-run shutout, and Kirk Gibson tripled before scoring on a passed ball by catcher Greg Myers. The Royals then got the winning run off Candiotti in the bottom of the 10th, thanks to a throwing error by Myers. So, Candiotti was that close to getting a third straight scoreless game. 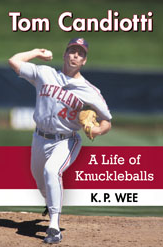 That wasn’t it for the knuckleballer. On September 18, he took a 1-0 lead into the bottom of the eighth in Seattle before the Mariners tied the game off of him on an Omar Vizquel triple followed by a Ken Griffey Jr. single. On September 7, Candiotti took a shutout into the ninth inning but gave up a home run to Carlos Martinez in the eventual 4-1 Blue Jays victory. In eight of his first 16 starts with Toronto following the mid-season trade, he took a shutout into the eighth inning – that’s half of his outings with the Blue Jays! With Kyle Gibson in 2014, six scoreless starts through his first 14 outings…perhaps he’ll add on to those numbers before the season is done. According to the June 17 game recap on ESPN, STATS noted that the 17 runs allowed by the two Tiger aces were the most ever by two teammates with Cy Young Awards in back-to-back team games. The Royals moved ahead of the Tigers atop the AL Central in the Scherzer game, and then defeated Detroit again the following afternoon by a 2-1 final in the third of their four-game set, ensuring that they would leave town in first place regardless of what happened in the series finale.